Official printers to World Land Trust, having printed WLT publications including WLT News for over 15 years, Kingfisher Press donate the cost of printing the Annual Review and some other WLT publications throughout the year. As printers Kingfisher Press work to best practice and have FSC accreditation which enables them to demonstrate, through independent certification, that the paper products sold or used come from well managed sources and exclude the risk of using illegally logged timber or funding conflict. FSC provides a way of tracking forest products, through a chain of custody, and with global standards for forest management covers a balance of environmental, social and economic aspect. They are also one of only 12 Carbon Balanced Publication Printers in the UK. This prestigious accreditation demonstrates commitment to the environment by assessing and calculating the corporate carbon footprint. The resultant carbon emissions are offset through World Land Trust’s Carbon Balanced programme by protecting and restoring threatened tropical forests that would otherwise be degraded or destroyed. Kingfisher Press are minimising their impact on the environment in other areas too and have achieved ISO 14001:2015 EMS accreditation, which ensures organisations comply with the relevant environmental rules and regulations to minimize negative environmental impact while building sustainable success. 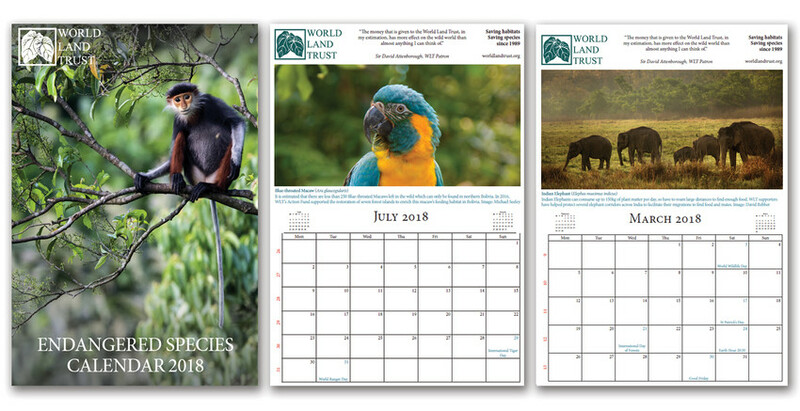 World Land Trust is grateful to Kingfisher Press for its support which this year includes the sponsorship of printing WLT’s 2018 calendar.